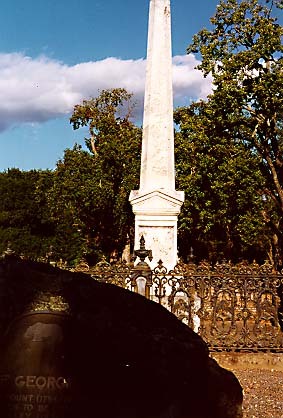 George Calvert Yount (1794-1865) was the first United States citizen to be ceded a Spanish land grant in Napa Valley (1836). Skilled hunter, frontiersman, craftsman and farmer, he was the true embodiment of all the finest qualities of an advancing civilization blending with the existing primitive culture. Friend to all, this kindly host of Caymus Rancho encouraged sturdy American pioneers to establish ranches in this area, which was well-populated before the gold rush. 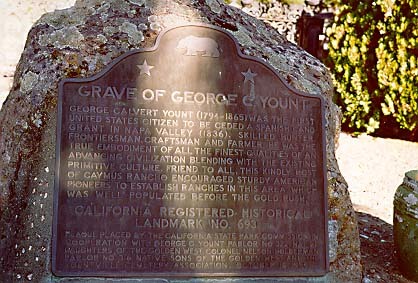 George C. Yount pioneer Cemetery, Lincoln and Jackson Sts, Yountville. Return to other landmarks in Napa county.